SoftPlanet makes it possible for everyone to get free Ashampoo Anti-Virus 2014 download directly from our servers. There is no registration needed for downloading. When it comes to your health you become highly alert and try to deal with all health problems using the best possible methods. Well, for some people, it is the same situation when it comes to the health of their PCs. And not only for them, because we all want our PCs to work without any problems and to be immune against all possible threats. Most of the problems come when you browse the web, work with your email client or simply when you have installed a program that contains harmful add-ons. If you want to quickly eliminate all eventual problems or heal your system once and for all you can take a look at Ashampoo Anti-Virus 2014 1.1.1. 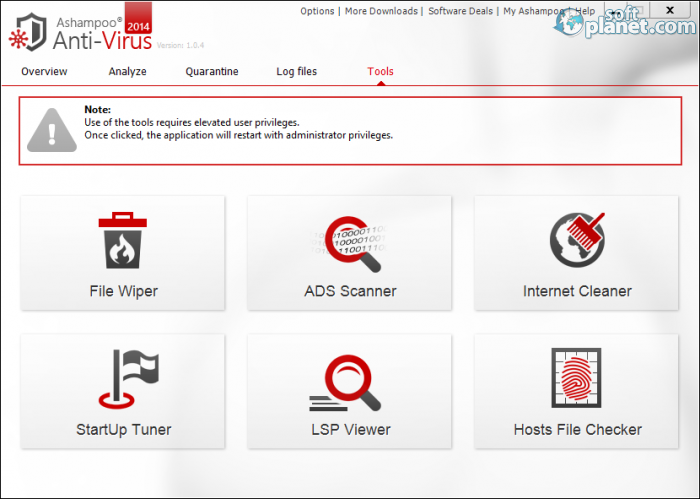 This software is relatively new to the antivirus community, but it offers a high level of real-time protection, a multi-engine scanner, a customizable whitelist, a game mode, and self-protection capability. The user interface can be used in one of the many supported languages (this is probably the most translated user interface). The system requirements of this app are low to moderate and you can install it on Windows XP, Vista, 7 and 8 versions. A detailed help file is included in the installation pack and you can refer to it at any time if you need it. Ashampoo Anti-Virus 2014 has a very nice user interface. Probably because of strong competition with other antivirus developers, this program looks like it is designed with style and with all modern resources. There are five tabs on top, but four of them double the function of the four tiles that are placed in the middle of the screen. The status of the program items is shown with a check mark next to each one and if it is green – this means that everything is OK.
Five are the menus at the very top of the screen and Options is the one which opens the Settings window. There you can change the skin of the program, the interface language, and some other things which are part of the Basic functions tab. The other tab is called Scan operations and is mostly oriented at file exceptions, scan engines, white list and other option preferences. The icon of the program sits in the system tray and when you call it a context menu it shows up where you can open the main application window, activate the Game mode and display statistics and other useful information. The trial version of Ashampoo Anti-Virus 2014 1.1.1 comes with a 10-day trial ?+ 30 days more after email registration? period during which you can test its capabilities. The trial program version is fully functional and has no restrictions. You can extend this time with 30 more days if you register for free on the developer's website. Once you are up and running you can perform a full system scan or a quick scan if you expand the Analyze tab. All kinds of external media can also be scanned and similar to most antivirus applications you can specify only particular files and folders to be checked for threats. To sum it up, we can say that Ashampoo Anti-Virus 2014 is a very good choice if you need decent virus protection. 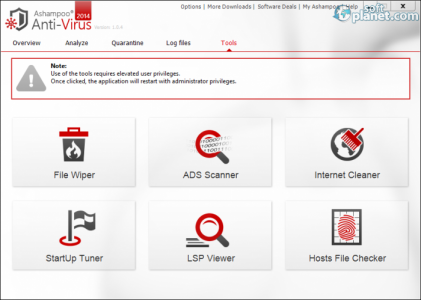 With its help you can stay away from all possible threats and keep your PC virus-free. Thanks to its highly-efficient protection engine you can continue to work knowing that your computer is safe 24/7. 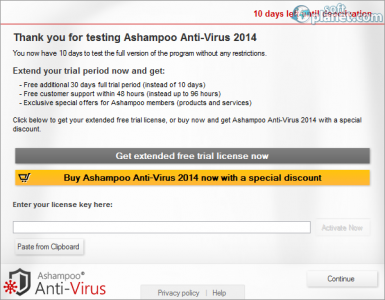 Ashampoo Anti-Virus 2014 is VIRUS-FREE! Our security scan shows that Ashampoo Anti-Virus 2014 is clean from viruses. The current version of Ashampoo Anti-Virus 2014 has been scanned by our system, which contains 46 different anti-virus algorithms. That ensures that Ashampoo Anti-Virus 2014 1.1.1 is 100% safe for your computer.